November 25, 2005 - Here's my two cents on 50 Cents. 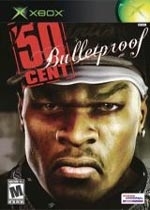 50 Cent: Bulletproof is more style than substance. This package is little more than a collection of his tunes, a reprisal of the movie and some generic gaming fodder that we've all seen and played in other games such as Max Payne, Dead To Rights, True Crime - that do it much better. This game is made for serious fans of the half-dollar man, and as such is not likely to garner any new ones. If you're a fan you're already privy to the name of the title, Bulletproof. It describes Fifty's almost supernatural resilience to death since he was filled full of lead on the streets of New York and left for dead by rival gangstas. The story is somewhat based on his real-life events but this isn't a biography. Fifty or "Fiddy" ends up working for the good guys as he goes on a revenge-fueled quest with the support of some of New York's finest to bring down the high profile gangs that rule the streets of the Big Apple. Fifty does his own voiceover and manages to coerce his peers, Eminem and Dr. Dre to also lend their voice talents to the game. Eminem plays a corrupt detective that is not only good at analyzing clues but good at filling his pockets. Eminem steals the show as he's able to display a range of emotions all delivered with the panache of a pro. Fifty and his G-Unit are not very flexile in their tone or emotions. All the lines are delivered in the vernacular of the tough, street thug which is very one-dimensional. Consisting less of conversation in favor of statements and the lame, amateur philosophies of street scum, these guys aren't really acting, they're just doing what comes naturally to them. And of course that includes rapping, fighting, shooting, stealing and generally breaking as many laws as can be broken in a regular gangsta business day. There are two crucial elements to this game that actually compromise its playability. One is the aiming system and the other is the unfair AI which continually swarms you. Having a faulty aiming system in such a circumstance is not conducive to enjoyable gaming. 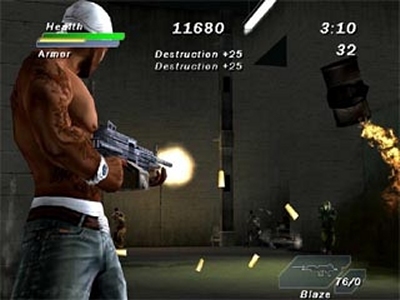 A large part of the gameplay is dedicated to shooting. There is no lock-on targeting system. It uses the freestyle method of which you can choose to have it fixed or not. Either way the system is slow to respond and highly inaccurate, especially when the AI is moving around all of the time. The sluggish response can be attributed to the actual movement of the character which is very plodding, making it difficult to get out of the way quickly. You will have to take cover wherever behind walls and garbage cans whenever you can since there are too many enemies to take on at one time. But even at that the enemies come out from behind as though they were hiding in garbage bins just waiting for you to come around. "This game is made for serious fans of the half-dollar man, and as such is not likely to garner any new ones. " Enemies respawn in areas that you've already cleared out making it impossible to claim territory and then retreat to a safe area. The AI will continue to assault you with guns, bats, knives and in hand-to-hand combat. I like the way the AI is proactively programmed but there are just too many of them and the constant respawning requires that you just try to get out of a level as quickly as possible without implementing any strategy or experimentation. 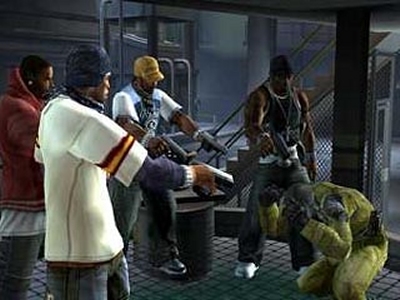 Later on in the game it will take more bullets to kill even the lowest-level thugs. I guess Fifty isn't the only one that's bulletproof in this game. Counter kills are moves that unarm your enemy and kill them at the same time. One move includes sneaking up behind, applying a chokehold that results in the weapon being dropped and then snapping the subject's neck. These moves are stolen from Dead to Rights. Another move involves shoving a large knife down an enemy's throat. You begin with a couple of these counter kills and you can purchase more later on. Keep in mind that just like the moves in Dead to Rights, these are graphics, gory and gruesome. From start to finish the game forces you along a linear path with very little in the way of freedom. You can do some exploring but only where allowed. The game will wait for you like a patient dog-owner while you sniff around looking for treats. There are tons of unlockables including musical tracks, videos of fifty and G-Unit, bling bling, accessories for your crib and an assortment of weapons. 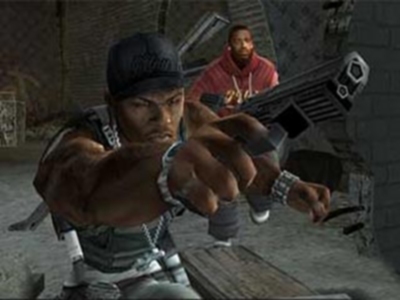 The adventure will take you through different areas of New York but you'll return to your hood after ever major mission to regain your health and stock up on fresh weapons. Character models are excellent. Slim Shady has never looked better. He's outfitted with the requisite detective trench coat and looks every bit as menacing as he does in real life. Not only can you tell who the characters are by their digitally re-created faces, but these faces are very expressive with virtually flawless lip synching animation. 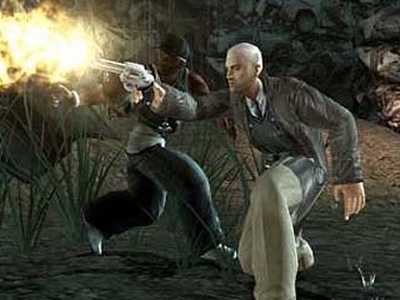 The cutscenes are loaded with cinematic effects worth of an MTV video with slow motion, tricky camera angles and other special effects. Fifty fans can look forward to tons of music, including remixes, instrumentals and vocal tracks. Some of the beats are looped for background music and add a vibe to the game that is truly in keeping with the 50 mystique. There are about four CDs worth of tunage here and if you like all of the songs, it's worth the price of admission just for the music. You can at least take comfort in the fact that you didn't pay anything for the game, if you want to look at it like that. The character models are fantastic. You're Xbox 360 friends will be jealous. Until they played it. If you don't care about being able to aim properly, then you'll like what this title has to offer. Eminem steals the show and proves that he definitely has an acting career in him. Oh wait, this is a 50 Cent game... oops. The music is awesome especially if you love 50 cent. Not much in the way of replay value and even the first playthrough is touch and go due to being so darn linear. Enemy respawns and ruthless AI will frustrate the ****** ******* crap outta you.